Ford Co-Pilot360 is the suite of driver-assist technologies slated to be standard on 90 percent of all new Ford models by the end of 2019. We here at Sheehy Ford of Warrenton love the entire suite of technologies. The following are two technologies that give an idea of how incredible the entire suite is. The Rear View Camera gives you a crisp view of the space directly behind your vehicle, especially at or below the level of your trunk. 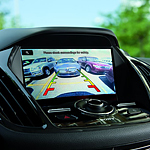 The camera activates whenever you put your Ford in reverse, feeding a signal to a high-def in-dash screen. Blindspot Information System (BLIS) complements Cross Traffic Alert technology, which uses radar to detect a vehicle that cross behind you or enters your blind spot as you drive forward or back out of a parking spot. The blindspot detection alert is an indicator light that appears in the side-view mirror, giving you the on-road information necessary to merge or change lanes safely and effectively.